Microsoft’s massive ad campaign promoting Windows 8 has arrived in magazines from publishers including Hearst, Time Inc. and Conde Nast. But glossy promotions fixed to the front of Conde Nast’s December issues seem to push boundaries that magazines have long observed. The promotions, full pages attached to the covers of 14 titles from Allure to Wired, show the new Windows 8 Start screen tailored for most of the magazines’ top editors. 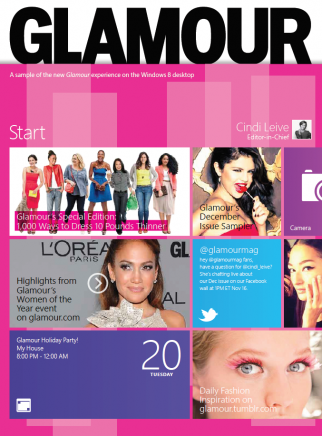 Glamour, for example, depicts a Start screen for Editor-in-Chief Cindi Leive with items such as highlights from a magazine event, a tweet that Windows 8 pulled in from @glamourmag, a December Issue Sampler for Windows 8, the Windows camera app, a special edition of the magazine and a holiday-party reminder from the new Windows 8 Calendar app. Editors traditionally avoid involvement in any paid ads that their magazines run, part of their effort to let readers know that they’re not under marketers’ thumb. Paid ads fixed to magazine covers are also generally required to be flagged as advertisements, according to guidelines from the American Society of Magazine Editors. The Start screen promotions are not. But the cover attachments aren’t paid ads at all, Conde Nast said — just the company’s own initiative to tell readers about its content on Windows 8. There were “no advertising dollars involved,” a Conde Nast spokeswoman said in an email. Microsoft’s paid ad campaign elsewhere in Conde Nast magazines is “separate and distinct,” she said. The covers are, however, “clearly coordinated” with the paid ads, the spokeswoman said. They are “tied together under the umbrella of our holistic relationship” with Microsoft, she added.